At noon of May 10, 2018 local time, Premier Li Keqiang and Prime Minister Shinzo Abe of Japan jointly attended the commemoration activity marking the 40th anniversary of the signing of the China-Japan Treaty of Peace and Friendship and reception welcoming Premier Li Keqiang's visit to Japan in Tokyo. Premier Li Keqiang and Prime Minister Shinzo Abe delivered speeches. Li Keqiang expressed that this year marks the 40th anniversary of the signing of the China-Japan Treaty of Peace and Friendship. Over the 40 years, China-Japan relations have travelled an extraordinary journey with both fruitful achievements and twists and turns. The Treaty has confirmed the various principles of the China-Japan Joint Statement in legal form, including the important remark that the Japanese side would deeply reflect on war responsibilities and adhere to the one-China principle. The Treaty has explicitly stated that China and Japan should keep long-lasting friendship, which establishes the political basis and legal norm and charts the correct course for China-Japan relations. Li Keqiang pointed out that the four political documents between China and Japan are the indicators and guidance that must be strictly adhered to for healthy development of China-Japan relations. As long as both countries faithfully abide by the four political documents and meet each other halfway, bilateral relations will enjoy steady and long-term development. Li Keqiang emphasized that during the visit to Japan this time, I have reached a series of significant consensus with the leaders of the Japanese side on promoting China-Japan relations back to the normal track and realizing the goal of long-term, healthy and stable development of bilateral relations based on reviewing and summarizing the previous experience and lessons. Politically, we have agreed to take history as a mirror while facing up to the future. We will maintain high-level exchanges and fully resume dialogue and cooperation mechanisms in various fields between the two countries. We will enhance political mutual trust and properly handle contradictions and differences. Economically, we have agreed to focus on the development of both countries and the improvement of people's livelihood, and elevate practical cooperation between the two countries to new levels, so as to better achieve mutual benefit and win-win results. In terms of people-to-people and cultural engagement, we have agreed to further strengthen our exchanges, build the closer relationship between the two peoples, and consolidate the public opinion foundation, so as to reinforce the positive forces that drive the development of China-Japan relations. Li Keqiang expressed that improvement and development of China-Japan relations face new opportunities. Both sides should adopt an active attitude to constantly put forward new measures to improve and develop bilateral relations, in a bid to enhance the sound expectations of and confidence in China-Japan relations of the two peoples and the international community. The two countries should remember the history and draw profound lessons from it. Based on mutual trust, the two countries should carefully maintain the consensus reached by both sides and consolidate the political foundation. Both countries should regard each other's development as opportunities and translate the concept of posing no threat to each other into specific policies and actions. The two countries should align development strategies and deepen practical cooperation. China and Japan should make innovation in ideas and approaches, give play to complementary advantages, deepen cooperation in key fields, and expand new space for the practical cooperation between the two countries, so as to benefit the two peoples. The two countries should strengthen non-governmental exchanges and promote the long-lasting friendship. Both countries should make good use of the opportunities of the 40th anniversary of the signing of the Treaty and the successive holding of Olympic Games in both countries, and widely conduct people-to-people and cultural exchanges in all fields, so as to enhance the people-to-people bonds. The two countries should shoulder the responsibilities and share the mission of the era. As major economies in the world, China and Japan have the responsibilities to jointly safeguard multilateral trade system, promote trade and investment liberalization and facilitation, and protect the hard-won promising situation of the world economy against the rise of protectionism and unilateralism. 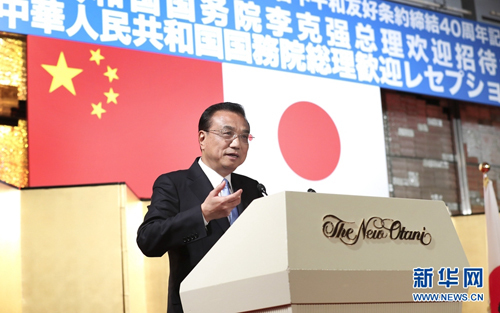 Li Keqiang pointed out that China and Japan share extensive common interests. As important close neighbors, as long as we follow the spirit of the Treaty, adhere to the general direction of peace and friendship, and show vision, courage and wisdom, the ship of peaceful and friendly cooperation between China and Japan is bound to set sail again and will achieve long-term and stable development, thus jointly creating a new future for bilateral relations. In his speech, Shinzo Abe expressed his sincere congratulations on the 40th anniversary of the signing of the Japan-China Treaty of Peace and Friendship. 40 years ago, the elder generations of politicians of both countries signed the Treaty with vision and wisdom, and the Article I of the Treaty is to develop a long-lasting peaceful friendship between the two countries. The Treaty is just like a compass, guiding both countries to overcome various difficulties and keep moving forward. Premier Li Keqiang's visit this time has brought bilateral relations back to the normal track, and relations between both countries will restart from a new starting point. At a time when bilateral relations restart, both countries are responsible for translating competition into coordination, thus entering an era of coordination from this day forward. As long as both countries jointly move forward, there will be no difficulties that we cannot overcome. Nearly 2,000 people from political and economic circles, as well as non-government organizations of both countries were present.